As I watched pet nutrition blogger Rodney Habib’s TedX video below, I found it simultaneously jaw-dropping and not surprising. After his dog, Sammie, was diagnosed with cancer, Habib went on a mission to find out why canine cancer is a growing epidemic. Currently, one out of every two dogs will be diagnosed with cancer at sometime in their life, mostly between age 6 and 12. I have a 13-year-old Labrador. Admittedly, I’m obsessed with my awareness that he’s approaching the end of his life. But, what if he weren’t? What if he could live until he’s 30 like Maggie, the Kelpie, from Australia. Maggie was possibly the world’s oldest dog. During Habib’s trek around the world, he spoke with researchers and scientists. He learned that dogs have a higher rate of cancer than any other mammal. In the ’70s, dogs lived to age 17; today the average life span is 11. Why? Diabetes is up 900 percent in dogs in the last five years. Obesity is up 60 percent. While 10 percent of all cancer cases are genetic, 90 percent are the results of lifestyle and environmental influences, including stress, obesity, infection, sedentary lifestyle, toxins, pollution and most importantly diet. Habib spoke with Norwegian scientist, Thomas Sandberg, who is conducting a 30-year-old study (the longest observational study to date). Sandberg is hoping to prove that poor quality food may cause cancer to develop in dogs and cats, mainly due to a compromised immune system. 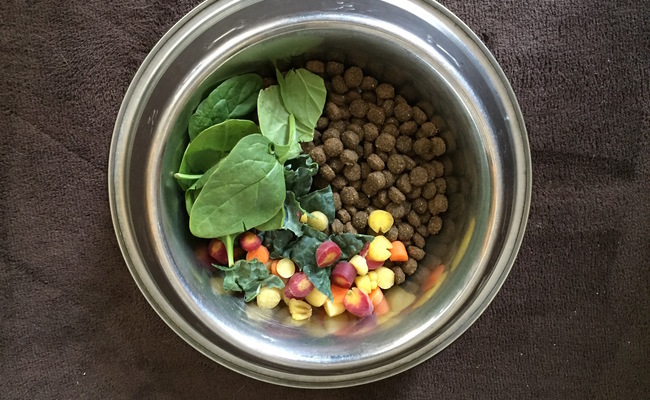 Here’s the part of Rodney’s TedX Talk that was jaw-dropping for me: Research shows that dogs on a diet of dry commercial pet food fed leafy green vegetables at least three times a week were 90 percent less likely to develop cancer than dogs that weren’t. And dogs fed yellow/orange vegetables at least three times a week were 70 percent less likely to develop cancer. I feed Sanchez and Gina organic kale, spinach, green beans and carrots, along with many fruits. 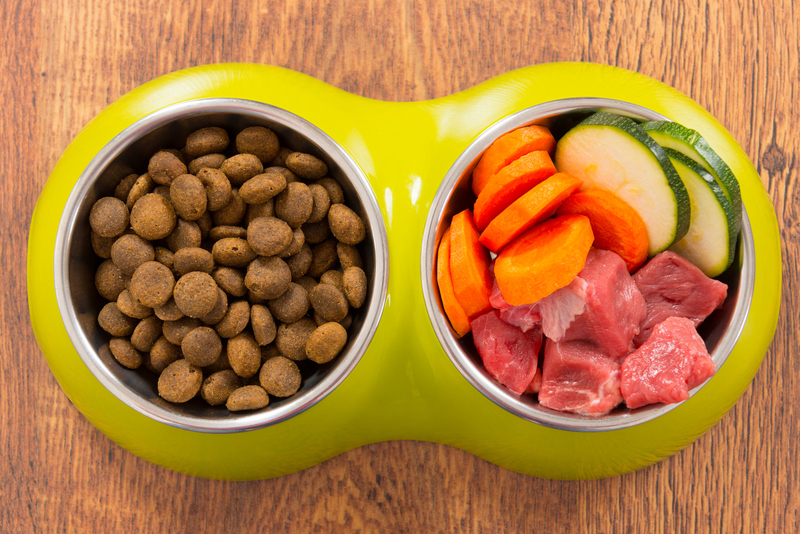 Personally, I wasn’t surprised by the benefits, but by the research showing that just a little bit of produce added to kibble could have such a profound effect on canine health. Thomas Sandberg has Great Danes, who typically live only six to eight years. In a 6-year study of 80 dogs fed a completely raw diet with low amounts of carbs, only one dog developed cancer. Another study at Purdue University showed a 90 percent decrease risk of cancer when they added green leafy vegetables to a bowl of processed food three times a week. Remember Maggie, the world’s oldest dog? In addition to a diet that included raw fed grass milk, she also self fasted some days. She lived on a dairy farm and exercised all day long, often getting in 9 kilometers (5 1/2 miles ). Obesity is also now known to be a contributing factor to canine cancer, which is why exercising with your pet is so important. We have dogs because we love them. We bring them into our human world and expect them to adjust. They do, because they want to please us. We expect them to follow our house rules, listen to the music we choose, build their life around our schedules, and accept the food we choose for them. But, what if we knew more and chose differently for them? How long would they live? Do your pets eat green leafy veggies? Thanks for sharing any of their favorites in a comment below. I wish I fed my dog better. I had a dog when I was a kid and never even thought of feeding him veg and fruit. I hate myself. My dogs love fruits and veggies but won't eat greens. Carrots, bananas, strawberries, blueberries and cucumbers are their favorites and make good training treats, especially if you have frozen the fruit. I've never heard of a dog being fed greens. Do they like their "veggie bowl" better than kibble?